The Yard-of-the-Month award for January goes to Gene and Ruth Mechura of 22302 Vobe Ct. They have lived in The Settlement for 10 years and have 4 adult children, 9 grandchildren and 3 wonderful great grandchildren. Their favorite thing about living here are the friendly people and the safe neighborhood. Gene and Ruth's yard is well manicured starting with the trimmed jasmine around the mailbox. The rounded flower bed along the walkway contains 2 large sega palms, a large bottle brush, savage, other bedding plants still in bloom and outlined in monkey grass. The Mechura'a have a beautiful side yard with flower beds. They have hollies, pittosporums and a windmill as a centerpiece along with a wheelbarrow holding a large fern. There are also several pots of red germaniums blooming. Gene said that they were his Mothers favorite flower. They also have a large raintree, angel trumpet and assorted shrubs along the fence. Thank you Gene and Ruth for contributing so much beauty to our neighborhood. The Yard-Of-The-Month Award for February goes to Mike and Susan Gray of 1619 Carters Grove. Mike and Susan have lived in the Settlement since 1997 and have 2 adult sons. Their favorite thing about the neighborhood is that it is well established, lots of friendly people and a great location to their work. Mike and Susan's yard is beautifully manicured starting at the street. The plant beds around the mail box are filled with knockout roses and two large pots are filled with large monkey grass and wide leaf lilies. As you walk to the front door, there are two large pots filled with ponytail ferns. The front of the house is lined with boxwoods and variegated monkey grass on both sides of the doorway. On each corner of the house and also the garage are flagstone walls filled with Aztec grass, ferns and a variety of plants and red azaleas along the side. Two very large oak trees provide shade in the front yard. Thank you Mike and Susan for adding so much beauty to our fine neighborhood. The Yard-of-The-Month award for March goes to Dan and Lauren Olenius of 1707 Prince George Court. Dan and Lauren have lived in The Settlement since 2008. They have one child, Jackson. Their favorite thing about our neighborhood is that it is established, quiet and friendly. Dan and Lauren have a beautiful yard. It starts at the street with pansies in the mailbox planter and proceeds to the front door where the shrubs are perfectly trimmed. Along the front are rows of azaleas, Japanese blueberries and boxwoods. Setting off the front flower beds are several rows of multi-colored pansies and at each corner and on the driveway side there are neatly trimmed mountain laurels. Completing this beautiful yard is a flagstone pathway leading from the driveway to the front door. Thank you Dan and Lauren for adding so much beauty to Williamsburg Settlement. 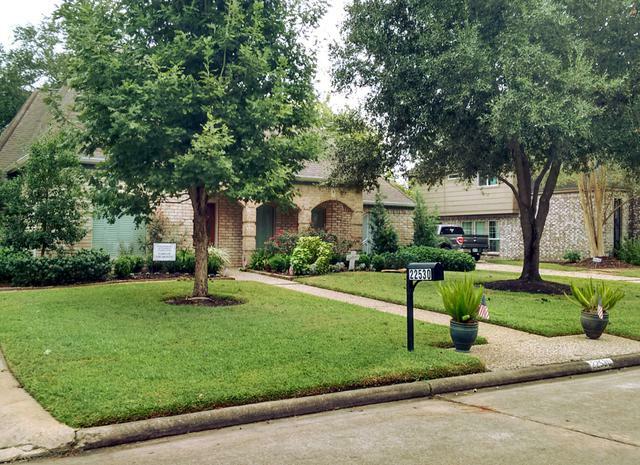 The Yard-Of-The-Month for April goes to Suzette Brasher of 22827 Spatswood. Suzette has two adult sons, John and Hugh and two beautiful grandchildren, Jackson 6 and Colin 4. Suzette is a longtime resident of Williamsburg Settlement, having lived here for 31 years. She loves it because it is quiet, beautiful and the people who live here are so very friendly. Suzette's beautiful manicured yard starts at her mailbox, where she has Dusty Millers, dwarf crepe myrtles, and lantanas. Her yard is ablaze with beautiful Judge Solomon bright pink azaleas, across the entire front of her home. On her drive way side she has a crepe myrtle, a white blooming bridal wreath and a red climbing rose. The entire front beds are bordered in liriope. Thanks you Suzette for adding so much beauty to our neighborhood. The Yard-Of- The-Month Award for May goes to Robert and Nancy Tucker of 22203 Wetherburn. Robert and Nancy have lived in Williamsburg Settlement for 3 1/2 years. They have 8 children, ranging in age from 24 to 57 and 10 grandchildren. Their favorite things about the neighborhood are the lovely well-kept yards, the friendly people and our location. The winding front walkway through the manicured lawn leads to a wrought iron front door gate. The front flower beds are beautifully landscaped. The first thing that you notice is several trellis's with jasmine blooming. Beds along the front of the house contain crepe myrtles, Indian hawthorns, photinias, red sisters, Aztec grass, box ferns and all outlined with several rows of pink begonias. On the driveway side are more photinias, lantanas and the bed is outlined in monkey grass. Behind the wrought iron driveway gate is a garden of tropical potted plants that include many assorted ferns and palms. Thank you to Robert and Nancy for contributing so much beauty to Williamsburg Settlement. The Yard-of-Month award for June goes to C. O. and Donna Holt of 22426 Wetherburn. C. O. and Donna have lived in The Settlement for twelve years. They have six grown children and eight grandchildren. Their favorite thing about the neighborhood is its maturity and that the houses are not all alike as is the case in some subdivisions. C. O. and Donna's yard is beautiful and perfectly manicured. A row of variegated pittosporum runs along the front of the house along with a lower row of Chinese fringe plants. The island flower bed is beautiful with an assortment of day lilies, hybrid day lilies, azaleas, and agapanthus. The pine tree is surrounded by ground cover. To top off this lovely yard is a flagstone area with an inviting park bench. Thanks to both of you for contributing so much beauty to our neighborhood. The July Yard-of-the-Month goes to Larry and Vivian Crain of 1631 Earl of Dunmore. Larry and Vivian have lived in Williamsburg Settlement since 1984 and have two adult children. Their favorite thing about our neighborhood is that it is quiet, peaceful and safe. The Crain's yard is perfectly manicured. The front plant beds contain a variety of plants, which include boxwoods, hawthorns, a knockout rose tree, hibiscus, esperanzo and society garlic. Larry and Vivian have two large island flower beds that contain boxwoods plumbago, butterfly plants and asphagus ferns. Each of the island beds are outlined in black island Mexican pebble stones and over 200 begonias. Thank you Larry and Vivian for adding so much beauty to Williamsburg Settlement. Congratulations on winning July Yard-of-the-Month. The Yard-of-the-Month award for August goes to Glen and Jane Thomas of 22207 Bucktrout. Glen and Jane have lived in The Settlement since 1986. They have two adult children, Chris and Katie. They love the whole neighborhood because it is family oriented and safe. This lovely yard is ablaze in color, starting at the street. These flower beds have geraniums, Cuban sky and roses. Around the trees are a variety of plants that include marigolds, Angelinos, and several different colors of caladiums. The beds across the front of their home have large blooming hydrangeas, a magnolia tree, crepe myrtles, verbena and gardenias on each side of the walk. Topping off this beautiful yard is a lovely park bench with decorative pillows. Thank you Glen and Jane for adding so much beauty to Williamsburg Settlement. Congratulations on winning yard of the month. The Yard-of-The-Month Award for September goes to Steve and Carol Judy of 1710 Palace Green. Steve and Carol have lived in Williamsburg Settlement for several years. They have four children ranging in age from 14 to 26. The Judys love living in the Settlement because of the community connection, friendly neighbors, the family environment and safety. They say it is just a great place to raise children. The yard is meticulously maintained. In the front flower beds they have large lantanas, enormous philodendron selloums and bedding plants. Around the wrap-a-round porch, are a variety of lilies, azaleas, agapanthus, caladiums and marigolds. On the side drive they have neatly trimmed ground cover and large ferns. Phlox surrounds the pine trees. Many thanks to Steve and Carol for contributing so much beauty to our neighborhood. The October Yard-of-the-Month award goes to Terry and Jo Anne Nickens of 22410 Unicorns Horn. Terry and Jo Anne have lived in the Settlement for 25 years. They have 5 children and lots of beautiful grandchildren. Terry and Jo Anne love living here for all these years because it is quiet neighborhood and a great location. The Nickens yard is perfectly manicured, starting at the street, with flowering potted plants. They have a wide assortment of beautiful shrubs. Crepe myrtles, knockout roses, boxwoods, azaleas and caladiums are in the flower beds along the front of the house. A large boulder decorates the front bed, along with 2 tilted pots containing pink begonias. Both sides of the flower beds are outlined with large variegated Aztec grass. This lovely yard is topped off with an inviting black wrought bench and decorative pillows on the porch. Thank you Terry and Jo Anne for adding so much beauty to our neighborhood. The Yard-of-the-Month award for November goes to Amanda Applegath of 22530 Bucktrout. Amanda has lived in Williamsburg Settlement for 31 years and now has two adult daughters. Her favorite things about living in the Settlement are that it is established and very well maintained. Amanda's yard is immaculate. Starting at the street she has a large pot with foxtail ferns on each side of the pathway. The curved flower beds along the front of the house have a wide variety of bedding plants and shrubs. These include begonias, large colorful coleus, knockout roses, boxwoods, bottlebrush, Indian hawthorn, a holly tree and Japanese Yews on each corner. A flagstone pathway leads from the front walk to the driveway. Along the driveway side, are nandina's and another Japanese Yew. A live oak and water oak shade the front yard. Thank you Amanda for adding so much beauty to Williamsburg Settlement. Congratulations on winning yard of the month.